In recent years, it has become apparent that the most significant threat to the world’s remaining forests is conversion for commercial agriculture and other non-forest use. 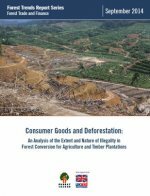 Agriculture alone accounts for over 70 percent of all deforestation across tropical and sub-tropical countries, along with other smaller drivers, such as mining, infrastructure, urban expansion, and remaining activities (Hosonuma et al. 2012)all in response to unprecedented demands from a growing population on forestlands for food, fuel, and fiber. In August 2014, for example, the Government of Indonesia announced plans to clear 14 Mha of forests by 2020 to provide more space for infrastructure, energy, and food supply despite ambitious emissions reduction targets (Jakarta Post 2014). While economic development and food security is a clear priority for many of the countries with the world’s remaining tropical forests, inclusive and sustainable growth needs to be nested within strong social and environmental safeguards, a strong sense of rule of law, and clarity on the land rights of indigenous and local communities who have lived in, cultivated, and held customary rights to these forests for generations. As the world seeks affordable solutions to enhancing development and prosperity for billions, land for agriculture must be acquired legally, sensibly, and sustainably.